Fiber is significantly important to the digestive system. One of the things that I should mention here is that vitamin D seems to have significance to the bowel at lower levels of vitamin D. The lining of the bowels are made of similar cells to skin cells. What we have done to our digestive systems is truly egregious. We have removed the fiber from our foods and then starved our systems of sunlight and ultimately vitamin D.
Please read the Mayo Clinic page for the full benefits of fiber. The thing that you should recognize immediately from this list is that excess cholesterol levels are related to how much sugar you eat and absorb and not to dietary fat. I know that this is different than what you have heard all of your life but medicine is slowly changing while trying to save face. I do not know the mechanisms, but when you eat fruit with fiber like whole fruit you do not absorb as much of the fructose in the fruit as when the fiber has been removed. Drinking fruit juices with the fiber removed is dangerous to your health. If you watch the video from my previous post on sugar by Dr. Lustig, Sugar: The Bitter Truth – UC television, you can appreciate the way he has you remember the importance of fiber. It is “fat or fart”. It seems that one of the reasons that dietary fiber has been removed is that it adds to significant flatulence. That is the reason when you eat beans that you have a lot more gas. The bacteria in our guts that digest dietary fiber become active and create this gas. It is typically methane gas or the worst of the greenhouse gasses. That is the reason that Al Gore wants to shot all of our cows. Just kidding! The other reason that dietary fiber has been removed is that it adds to bulk which makes the shipment of foods more expensive. So there you are with your glass of apple juice or orange juice with the dietary fiber removed and eating your white bread sandwich that also has the dietary fiber removed. I hate to think about all of those meals that I feed my kids when they were growing up that was made of the above fiber-less foods. I could have just given them a beer and whole wheat pretzels and it would have been as healthy. It also seems that fiber helps our bodies to know when we have had enough food. The fiber in food somehow aids the lepton signal to the brain to say, ‘ hey dude, you have had enough’. I do not know if this is from bulk or from some other mechanism. It was mentioned in Dr. Lustig’s video. 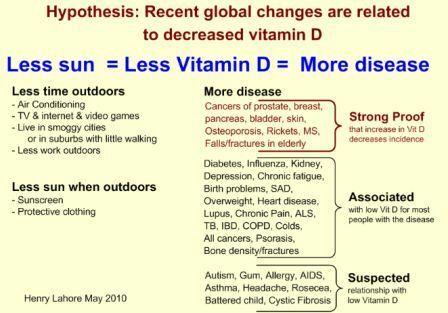 Henry Lahore is a retired engineer that found out about vitamin D in 2009. Like me he likes to help people. He has been busy reading the research and has created vitamin D Wiki. 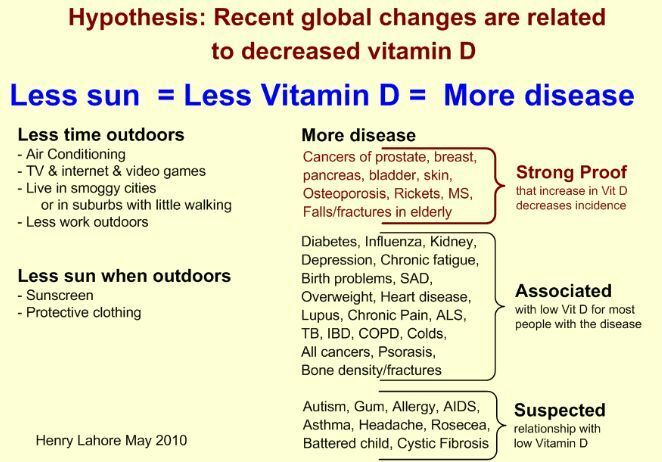 Here is his hypothesis on how our life styles have created disease states from vitamin D deficiency. If not for the large amount of sugar in the American diet, I suspect there would be no obesity. Of course some sugar is a really good thing if it is in whole fruit. Okay, so you want to put a tablespoon of sugar into that large pot of green beans and that is probably okay as well (and if you are cooking then for me throw in a piece of bacon too). It is not only the large of amount of sugar that we consume but also the type of sugar. High fructose corn syrup is destroying our metabolic systems. The FDA approved HFSC to be used as a sweetener because it is generally regarded as safe or GRAS. It is sugar, how could it be bad? No tests were made on HFCS, because it is made from corn that we consume regularly. The problem with consuming concentrated corn syrup is that our bodies are not made to take in these large amounts of fructose without fiber being present as in an apple. It turns out that HFSC is processed by the liver and one of its major end products is uric acid. Large amounts of uric acid are not good for you. It can lead to gout which is an inflammation of the joints. If that was all that it did maybe we could live with it. However uric acid causes inflammation in all parts of the body. The other thing that uric acid does to you is that it drives up your blood pressure. I suspect since it promotes inflammation that it is also responsible for allergic response. Uric acid triggers your immune system to respond. Here is an interview by Dr. Mercola of Dr. Richard Johnson author of the Sugar Fix. You will be startled at his findings on what happens with uric acid in the body. Here is the link to Dr. Mercola’s website: This common food ingredient is as addictive as cocaine? It seems that there was a recent test of over-the-counter, OTC, vitamin D that was presented at a meeting for the Consortium of Multiple Sclerosis Centers and America’s Committee on Treatment and Research in Multiple Sclerosis. Neurologists typically have their patients with MS take at least 4000 IU of D3 per day. The samples were collected both from drug stores and online. Here is the article. From MedPage Today. The samples had an average value of vitamin D that was 33% of what the labels stated. As I mentioned on a prior post, there was a problem that was recognized by Dr. William Davis with his cardiologist patients not getting enough vitamin D when using a brand that was purchased at Walgreens. Link to that post here.